This post brought to you by Schneider Electric . 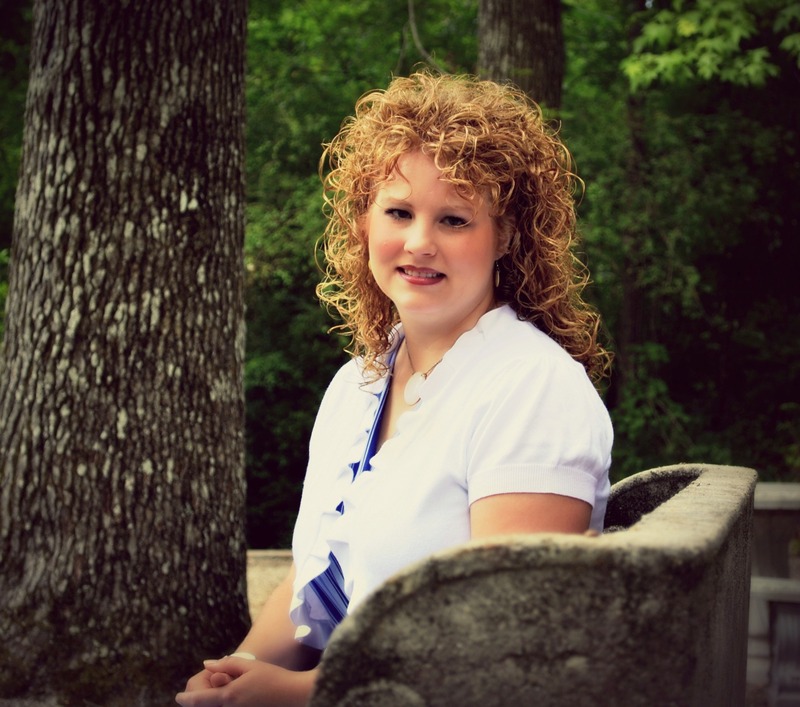 The content and opinions expressed below are that of The Frugal Homemaker.com. This new house has brought all kinds of challenges. Lots of things we didn’t foresee needing repaired or fixed and lots of upgrades that needed to be done. One of those was the thermostat. The first week we were here in May we woke up freezing every morning with the air conditioner on full blast! Turns out that the morning sun came in the top living room windows and focused right on the thermostat on the wall – making the thermostat register 80+ degrees so the air just kept going and going trying to cool the house down when in reality the house was 60 degrees! So we quickly switched it out to a very basic programmable thermostat – an old one my brother had laying around and gave us. That helped with the morning sun issue but didn’t solve all of the issues and certainly wasn’t as energy efficient as it could be. We had much higher electric bills than we have ever had this summer and knew we really needed to do something to help with energy usage and better manage our heating/cooling especially going into the winter. That’s when I discovered Wiser Air! 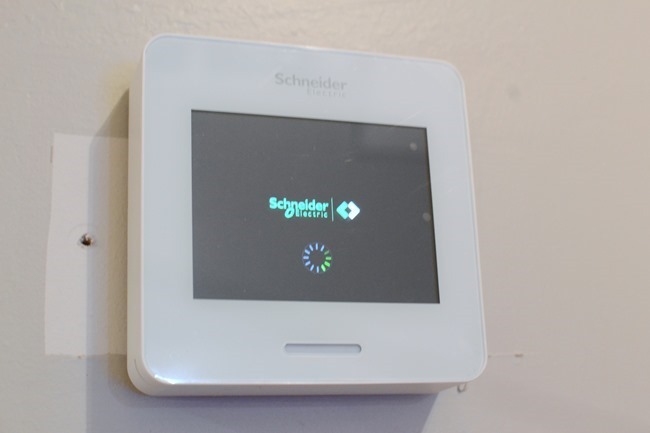 It can be set up to operate 2 basic ways – using an easy to set up programmable schedule or by using Eco IQ™. Eco IQ™ works by self-learning finds the right temperature for you. No schedule, and no picking a certain temperature number that you think you want for your comfort. 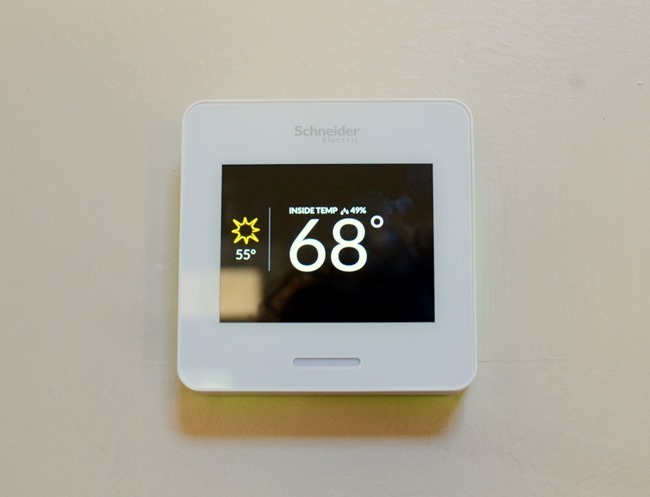 You just let the thermostat know if you are too hot or too cold – bump it up or down on your phone or on the screen and it optimizes comfort and savings based on user-interaction and other factors such as home thermal profile, humidity, outdoor weather, and system run times. It truly adjusts to your home and your needs. Another feature I really loved is Comfort Boost. I often get in a cleaning frenzy, am working on some intense DIY project, or am in the middle of cooking in the kitchen and end up roasting hot and wanting to bump the air down much to my husbands dismay. This feature allows you to get instant heating or cooling without changing your carefully optimized schedule or affecting the learning algorithms. A burst or hot or cold air just for a few minutes to get our house comfortable again. I had the new one up in running in less than 15 minutes- very simple installation and setup. 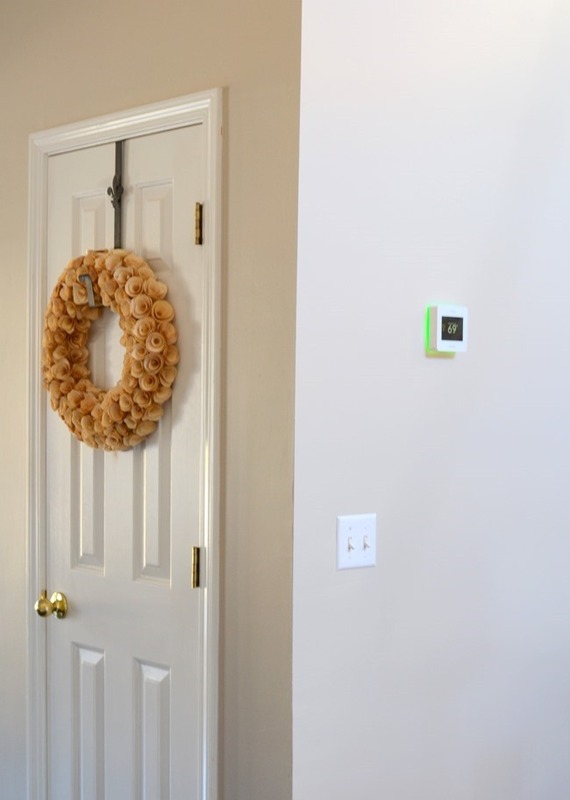 Add another DIY skill to my tool belt – changing out a thermostat! First turn the system to off and then flip off the breaker for the HVAC system to off. 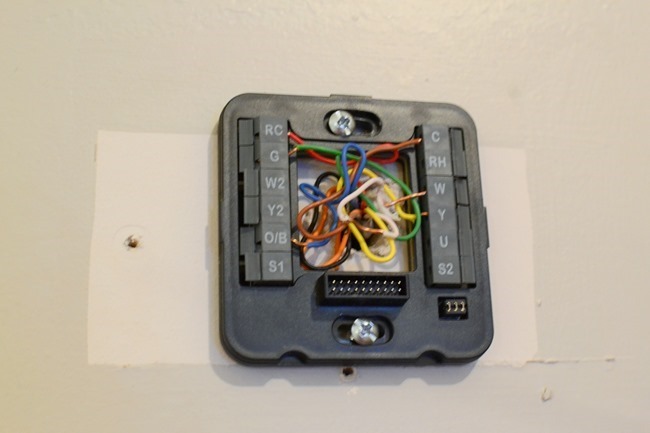 Remove the old thermostat and very important – take a picture of the wires! 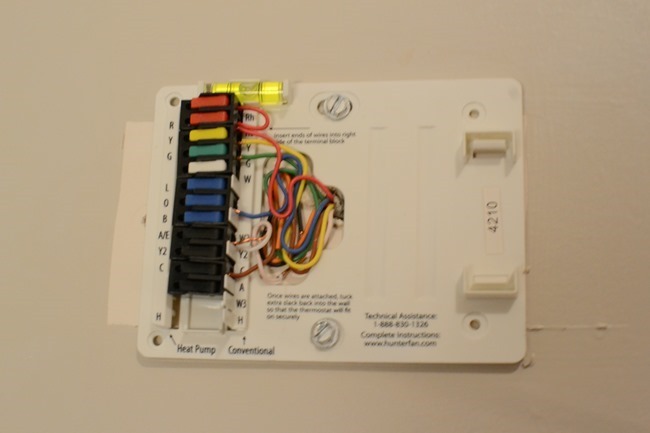 You will want to remember which color wire goes in which colored slot (the colors don’t necessarily match up). You may even want to write it down. 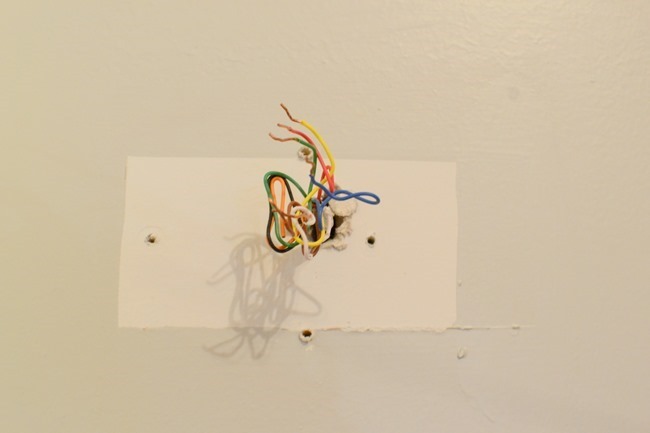 Then install the back of the WiserAir thermostat matching up the wires to the same letters they were installed on in your old thermostat. Snap the front of it on and it powers up! It walks you through a few simple steps to connect to your Wifi and sync to your phone app and then it is ready to use. 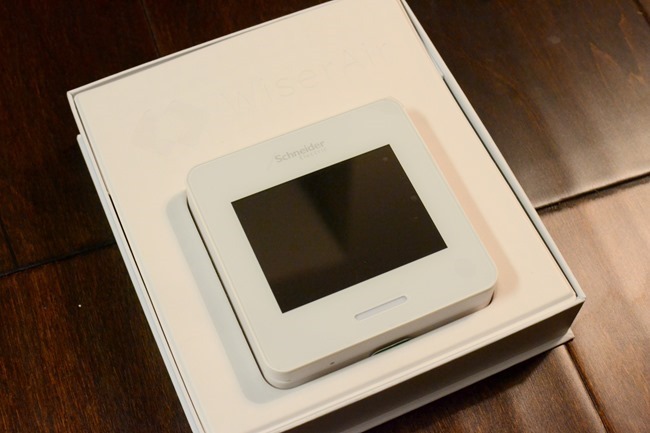 WiseAir includes a large backplate that you can opt to use to cover up a larger hole or messed up wall. But I loved the sleek look of just the thermostat so I patched that one extra screw hole and touched up the paint the next day. 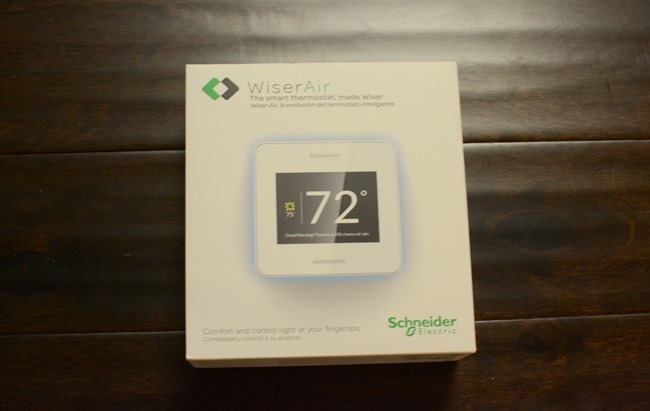 It features Wiser Pulse: an ambient glow feature on the thermostat that lights up BLUE for cooling, YELLOW for heating and GREEN when Eco IQ™ is saving energy. And then the screen will just go to black when no one is in room to save even more energy. And if a thermostat could ever look “pretty” this one definitely does! We are using the Eco IQ™ function right now and I can’t wait to see if we have a difference in our utility bill this month. Or course here in the south this is sort of an awkward temperature time anyways – sometimes 80 during the day and then 30 degrees the next night so you can end up using air and heat in the same day. Gotta love the south! Are you getting your house ready for the winter? The fall brings a list of maintenance needed on your home whether it is yard work, changing air filters, installing new weather stripping (next on our list to do! ), or even installing a new thermostat. Thankful for one more thing checked off our to-do list! as a senior, I have not kept up too well with all the new technical treats ….. you do so well with it all Christina, good on you!! this looks like a wonderful help, it will be interesting to see how it works out in the future …. let us know! ann lee s in bc Canada. These are great tips! we recently just changed out our old thermostat to a new programmable one and wow I notice our electric bill went down a good bit, thanks for sharing this! Consider a smart thermostat that will allow you to program your home’s temperatures from your phone or computer, even when you are miles away.